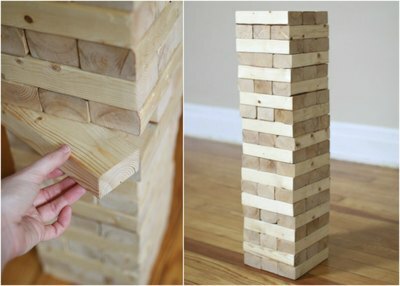 If you're ready to graduate from the tabletop version of Jenga to an oversized version of the game, it's not a difficult project to make with some boards, a saw and sandpaper. 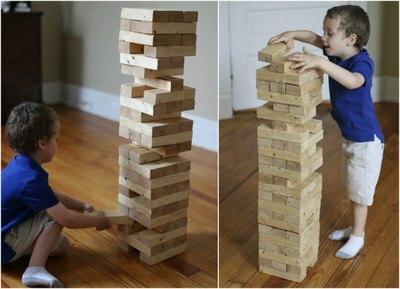 To play, wood blocks are stacked in a tower; each player removes a block, stacking it back on top of the tower, hoping he isn't the one who makes it fall. 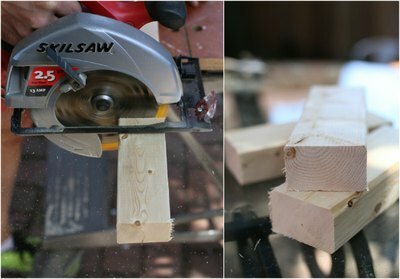 Using a circular or table saw, cut the five wood boards into 7.5-inch length pieces, which will yield 60 wooden blocks, or 20 stackable rows, for the game. 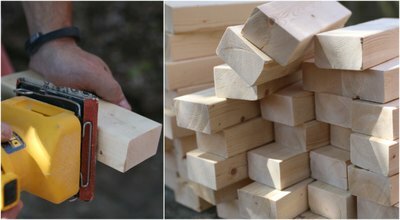 Cutting the wood into 7.5-inch lengths ensures a perfect square when stacking the game pieces in alternating directions. Tips Look for a straight wood board with smooth sides. Most hardware stores will cut purchased wood to any size for no additional charge while in the store. * If using a different sized wood board, cut into lengths that equal the exact sum of three times the board width. 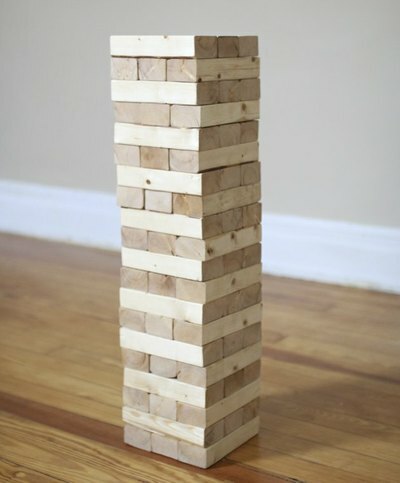 Note: In a classic game of Jenga, there are 54 pieces, or 18 rows. The additional six pieces in this project leave room for error or provide two additional rows for this oversized version game of skill. Using a medium-grit sandpaper, sand each of the wood blocks to smooth any debris, jagged edges or splintered areas. Tip: Use a palm sander to speed up the sanding process. Coat each of the wood blocks in a natural, nontoxic wood finishing oil, such as coconut, hemp seed or tung oil. Allow the oil to fully soak in, wiping any excess into the wood with a dry cloth, if needed, until dry. 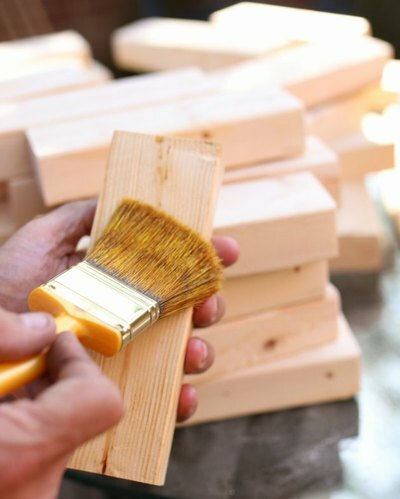 Tip: Customize the blocks with wood stain, paint or another form of personalization at this stage if you prefer a different finish. To play the game, stack the 60 wood pieces in rows of three, alternating the direction. Doing so will result in 20 evenly stacked rows. Each player takes a turn carefully removing one block from the tower and then stacking it in a new alternating row on the top of the stack. When the tower inevitably comes crashing down, the last player to successfully stack the last block is the winner. Learn more about how to play this game of strategy here. 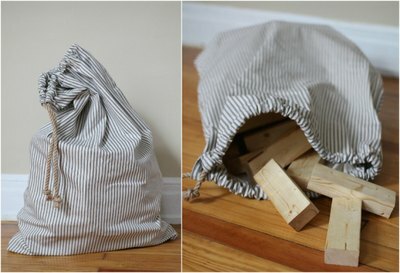 A simple drawstring bag, like this canvas version, can be made to store all of the game pieces. Use the game at outdoor events or as an indoor activity. Tip: If using as an outdoor wedding activity, supply guests with a permanent marker to sign the blocks as a guest-book alternative.